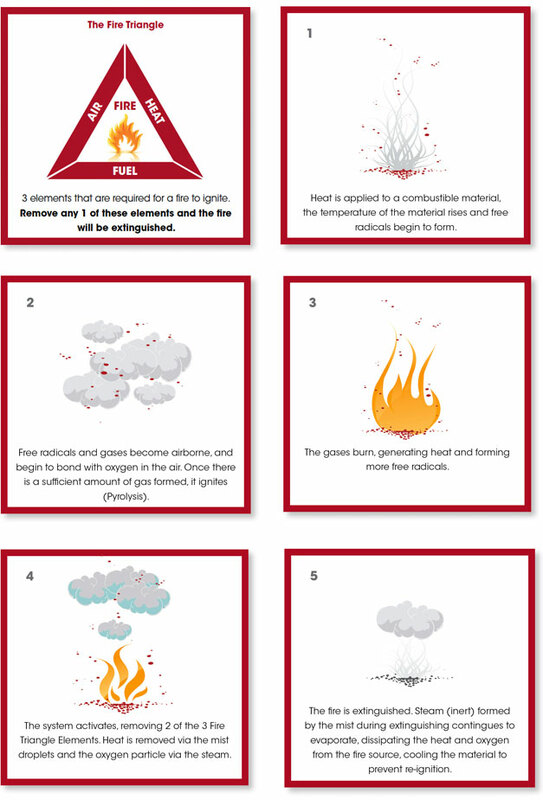 Fighting Fire with Water – How does WaterMist work in the suppression and extinguishing of fires?. By applying low pressure, fine water droplets, known as ‘WaterMist’ over, around and into the flame, our WaterMist technology suffocates the fire. As the mist converts to steam it removes the oxygen, simultaneously reducing the temperature at the source of the fire, therefore eliminating the production of flammable gases (free radicals). Having removed the oxygen and cooled the fire, the flames are extinguished. The WaterMist technology generates a consistent droplet size of around 50 – 75 microns, which equates to an excess of 1,910,828,025 droplets from 1L of water giving a surface area of 60sqm. This provides a large surface area for the successful exchange of energy, approximately 2592 kJ/kg, whch is responsible for the rapid cooling of the fire. FireBug WaterMist is cutting edge, intelligent technology allowing the WaterMist system to tackle a blaze with a consistent droplet size and kinetic energy, essential in effective control of class A, B, C, Electric and F fires. The WaterMist used in our systems is pure demineralised water and naturally contamination free, making it ideal and safe for discharge in all locations, especially highly populated or sensitive areas. The engineering behind our WaterMist ensures that the damaging effects from smoke and flooding are all but eradicated.